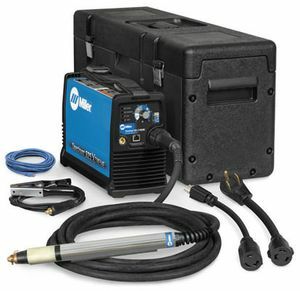 The Miller Spectrum® 625 X-TREME™ Plasma Cutter with XT40M machine torch is designed specifically for CNC automated plasma cutting applications. The 625 has 40 amps of output power to cut through up to 5/8" mild steel. The unit offers easy connection to 120V or 240V input with Auto-Line technology and MVP Adapters and comes complete with interface cable..
NEW! Ultra-Quick Connect™ XT40M 180 degree machine torch with flexible cable that makes maneuvering easier. X-TREME Protection - X-CASE™ provides ultimate protection during transport and storage. Additional space ideal for MVP Adapters, consumable box, as well as gloves, eye protection, etc. XT40M long body machine torch with 25-ft. (7.6 m) cable. 20-ft. (6.1 m) automation control cable, shield sense tab, and a front panel with built-in remote control cable receptacle for remote trigger, ok-to-move signal, and voltage sensing. Genuine Miller replacement parts for your XT40M machine Ultra-Quick plasma torch (Miller Spectrum® 625 X-TREME™ ONLY). Looking at the 625 (907579002) with the automated torch handle for a CNC table I've purchased, what's the over all length of the long body automated torch handle, and the length of the gear drive on the handle? Miller advises that the long body torch that comes on the Spectrum 625 is about 15 and 9/16".They also advised that the gear drive is 8". I just bought the 625 extreme with hand torch....will the machine torch work with this unit, I understand there's a cnc cable needed also? I am aware that the 625 comes in a machine version, and a manual version. The base unit for the machine version looks a little different from manual version (e.g. an ethernet port on the front). If I purchase the machine version, and a manual XT40 torch P/N 260633, will the XT40 torch work OK with this system?